Hey, guys, i am back again with another awesome guide. The guide is about how to install android 7.0 nougat Rom on your nexus 4 devices. 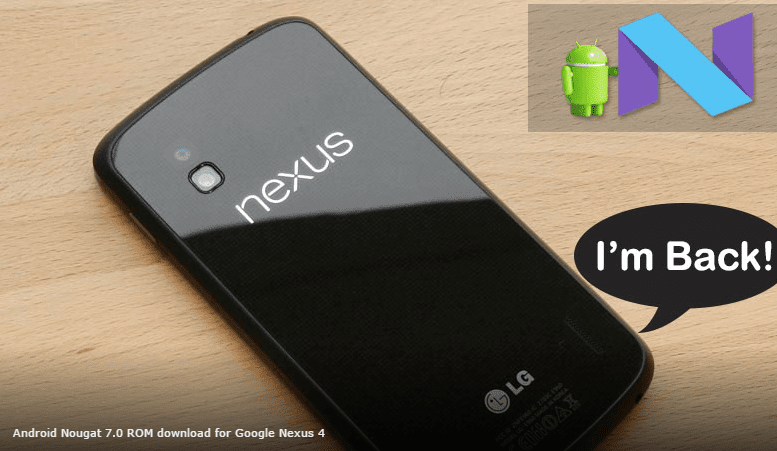 During 2012 the google had launched its first nexus device called nexus 4. It was the first android smartphone which supports all new android versions.It received all the updates directly in no time. But now google has launched its new devices and variants, recently google has launched nexus 6P. It has lots of features and it will get latest updates in No time. But in a case of nexus 4 and nexus 5, they both are devices which will not get any latest updates from google because of the Old models. Google has announced that the old nexus devices will not get any latest update from it but some developers are out there who develop the custom Roms fro nexus 4 and 5 device which is awesome for old nexus users . The legendary Nexus 4 is still holding up strong & ready for android Nougat 7.0 ROM update. As we all know about the android 7.0 nougat has lots of new features but let’s again talk about its cools features android nougat provides a lot of major improvements and refinements over marshmallow, along with quite a few nice new usability changes . There’s a way more exciting background stuff going on in nougat that you see on the surface. Android 7.0 nougat ROM has lots of features but have some bugs because the ROM was not official Launched for nexus 4 and 5 devices but there are some developers out there who will no leave nexus 4 and nexus 5 . so they made custom ROM for these devices but have some bugs . The BUGS are listed below. After installation completes successfully, select”reboot” . First boot will take up to 5-10 minutes don’t panic your device will be on. So, guys, we learned to about how to install android 7.0 Nougat android OS on your nexus 4 device unofficially. As I told you above that the ROM is not available official y for nexus 4 device but . The developer has made AOSP ROM for it. you can flash this awesome ROM on your device and take enjoyment by using 7.0 latest version of OS. But you need to have care some BUGS. the ROM has lots of bugs use it at your own risk. Thanks for visiting my blog . Install this ROM, If you find any new features then comment the features blow I will add them on my list.